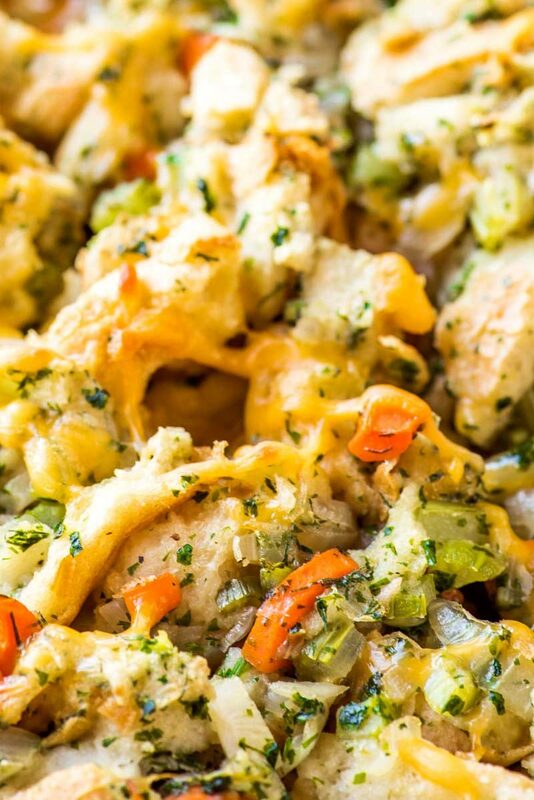 A traditional herb stuffing made with crispy french bread, cheddar cheese, tender onions, celery, and carrots, plus an extra dose of herbs. An easy and cost-effective side dish for any big dinner or event. 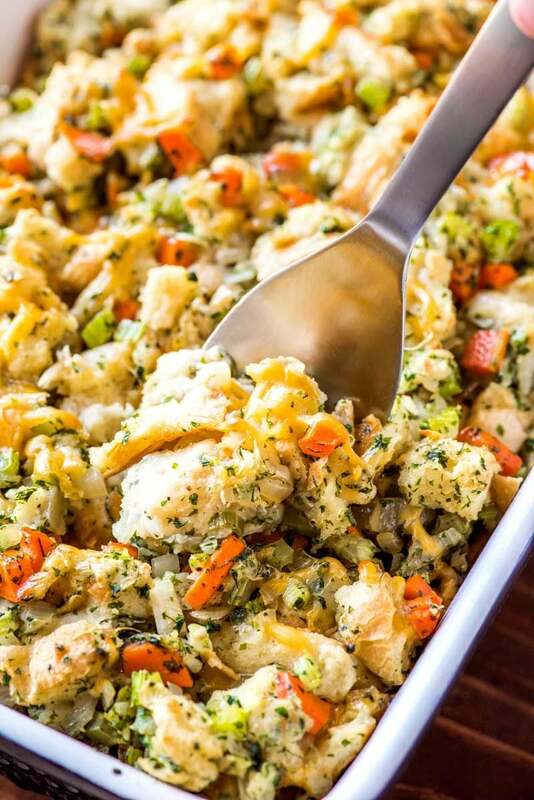 When it comes to big holiday dinners, there’s nothing more classic than a baking dish full of cheesy herb stuffing. And, you guys, this recipe has been a dinner-saver on more than one occasion. Because you see, big dinner events are usually not “my thing.” For 99% of the year, it’s just The Husband and I in our house, and we don’t need a lot to call it a meal. But ever since my mother made the move from Virginia to Arizona, I’ve felt the need to up the anty. I don’t know if I’ve just missed the family experience or if I’m showing off a bit, but I like the idea of us having a big family dinner on special days, even if the table is only set for three. I’ve whipped this recipe out for the past few of those family dinners, and so far, it’s been a hit every time. Another thing I love about this recipe? Now, I know not everyone would consider that a perk, but when you’re making a bunch of different dishes, I think there’s definitely some benefit in keeping the side dishes simple. Odds are good you’re already cooking up a main dish that consists 90% of meat (or more) – so why not just stop there? Keep the meat with the main dish and give yourself more options for sides. Veggie side dishes can still bring plenty of variety. Plus, this stuffing recipe will likely end up being a little more cost effective because of it, too. Is there a difference between stuffing and dressing? The Husband and I have talked about this a lot, because in my world, this recipe is for stuffing. However, he will insist it should be called dressing. So, which one of us is right? Well… both of us are. In a way. 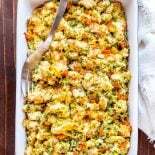 But despite that, you’ll find areas all over the United States who will prefer to call this stuffing so that it isn’t confused with, well, sauce dressing (like ranch, thousand island, etc). And then you’ll find whole pockets of the southern United States who will refuse to use the word “stuffing” because of how unpleasant it sounds. And let’s be honest, it does sound a little questionable, especially when you’re talking about it in front of your family. All of that was really informative, Chrisy, but it doesn’t answer the question. So, what should you call a dish like this, then? In the end, you can call it whatever makes the most sense to you. Which is exactly what The Husband I do whenever I make this – we say our favorite words, multiple times a day, as if there’s a competition going on (there is) and whoever says their word the most wins (I will totally win). The beauty of stuffing recipes is how easy they are to make. When making a stuffing recipe, it’s usually broken up into three parts. Part 1 – Preparing the bread. When it comes to the bread, you can either toast it in the oven or you can leave the bread out overnight, uncovered, so that it dies out a bit. Both methods will leave you with bread that’s slightly crisp, which helps it keep it’s shape and texture while preparing the stuffing. I tend to prefer leaving the bread out overnight because it’s one less item that needs to rotate through the oven. Part 2 – Cooking any veggies. There are some vegetables that you always want to cook in a skillet before baking, such as onions, celery, peppers, and carrots. This recipe includes many of these ingredients and has instructions on how to properly cook them so the veggies are nice and soft. Part 3 – Mix everything together. Once the prep work is done, all that’s left to do is to mix everything together and bake. With the right preparation, you can make most of the ingredients in advance and only have to worry about assembling the baking dish the day you’re serving dinner. 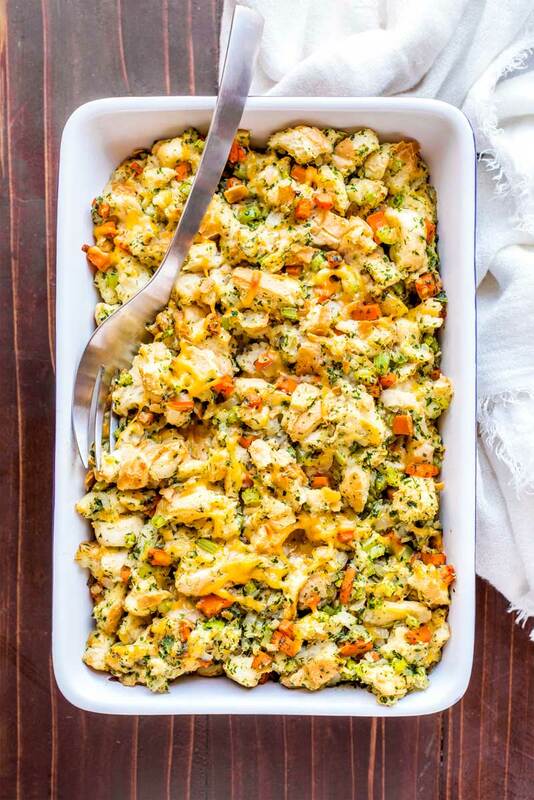 For most stuffing recipes, you’ll need a trusty 9×13 baking dish. I like this one because not only is it good quality but it also makes a pretty serving dish. You’ll also need a large bowl for this recipe. I like this 13 quart mixing bowl because it’s light, easy to handle, and more than big enough for all the ingredients. Preheat oven to 375 degrees F. Spray a 9x13 baking dish with cooking spray, then set aside. In a skillet over medium-high heat, warm olive oil. Add onions to skillet and season with salt and pepper, to taste. Cook uncovered, stirring frequently, until onions are translucent and fragrant, about 8-10 minutes. Add celery and carrots to skillet and cook, stirring frequently, until carrots are tender, about another 15-20 minutes. Add parsley to skillet. Stir to coat veggies, then cook for 1 more minute. Remove skillet from heat. Add in dill and toss all ingredients together, then set skillet aside. Add dried out cubed french bread to a 13 quart mixing bowl. Pour chicken broth on top of and toss bread until all broth has been completely absorbed by the bread. Add beaten egg to bowl and gently fold into bread. then pour cooked veggies and cheddar cheese into bowl. Thoroughly stir all ingredients together. Pour stuffing mixture into prepared baking dish, spreading out into an even layer. Cover baking dish with aluminum foil and bake for 10 minutes. Remove foil and bake for another 25-30 minutes or until the top layer of bread begins to turn golden brown. No dill is listed in ingredients but it does show up in instructions.